Ken Delmar grew up in Manhattan surrounded by art and artists. His mother, Alice Cochran Delmar, was a museum-caliber floralist. He learned about color and anatomy from his aunt, Ann Cochran. At Middlebury College, he studied watercolor under Arthur K. D. Healy, and oil painting under Rosemary Beck. He subsequently leased a loft in New York’s SOHO and began painting large semi-abstract figures, in oils and pastel. After military service, he took up residence with his wife and newborn daughter in Stamford, CT, and painted large figures in acrylic. 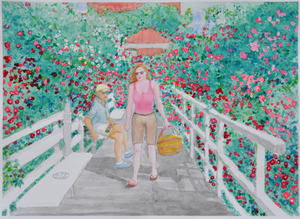 Pieces from this period were exhibited in a solo show at the Sound Shore Gallery in Stamford, Connecticut in 1990. 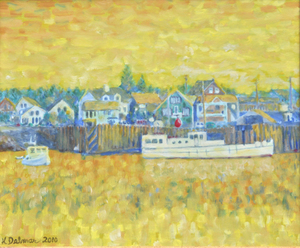 In 1991 Delmar began painting representational scenes of the sea and shore. In 2000 he was given two solo shows of this series, one in the Caron Gallery in Chester, CT.
One evening in 2013, he cleaned his brushes on a paper towel and noticed that the oil paint looked more brilliant than when painted on traditional media. The next day he began painting faces and figures on paper towels. This was discovered by Bounty via the Internet, and a subsequent PR campaign boosted Delmar’s name and fame substantially. He ended up with several videos on YouTube, extensive worldwide print exposure, and guest appearances on several TV shows, including The Queen Latifah Show. Delmar is now painting on linen and is working on big pieces for a gallery in Manhattan. His latest work is now focused in a new genre he calls “primal”. There are no models, scenes, photos, Google images, “appropriation”, tracing or copying of other images. The artist paints directly from his mind’s eye, heart, memory, or emotion. His latest works are mandalas comprised of multiple stylized figures. Delmar’s work hangs in private homes, galleries and public buildings in NYC, Fairfield County, Vermont, Maine, California, Germany and across the USA. His most recent solo exhibitions include: 2013 at the George Billis Gallery in Chelsea, Manhattan, 2014 at the Rockwell Gallery in Ridgefield, CT and June/July 2017 at the Loft Artists Association Gallery in Stamford. Visit his website; KenDelmarArtist.com for links to video and print features of his work, and for news of upcoming exhibitions.